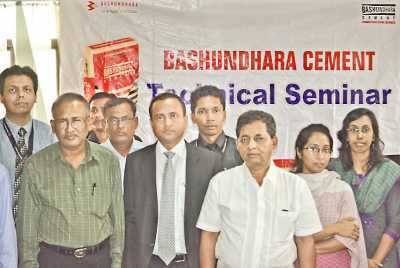 Bashundhara Cement’s technical seminar concluded at the conference room of Bangladesh Power Development Board in Dhaka Saturday. Engr. Md Korban Ali, Chief Engineer (Civil Works) of Bangladesh Power Development Board (BPDB) was present as chief guest at the seminar, said a press release. Md Motahar Rahman Chowdhury, Director, Bangladesh Power Development Board and other engineers of BPDB were present at the function. Md Saiful Islam Helaly, Chief Marketing Officer, Cement Sector, Bashundhara Group, Engr. Saroj Kumar Barua, Manager, Technical Support, Cement Sector, Bashundhara Group and other officials of Bashundhara Group were also present. Md Saiful Islam Helaly, Chief Marketing Officer, Cement Sector, Bashundhara Group, delivered welcome address at the seminar. While speaking, he highlighted the Bashundhara Group and appraised the production capacity of its new cement factory at the seminar.